Two years have now passed. Our world is a darker place without you here. You were our sunshine. 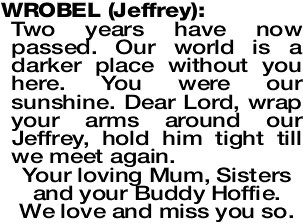 Dear Lord, wrap your arms around our Jeffrey, hold him tight till we meet again. Your loving Mum, Sisters and your Buddy Hoffie. We love and miss you so.